Much has been written of China’s Belt and Road Initiative as observers seek to understand its objectives, both stated and unstated. The initiative was first launched in 2013 as “One Belt, One Road” and essentially translates to China investing billions of dollars in infrastructure development in countries along the old Silk Road linking China with Europe. The modern Belt and Road Strategy gained full legitimacy this year when it was written into the Chinese Communist Party Constitution. Any constraints were thus swept aside and the way cleared for China to accelerate investment in the Strategy which is already estimated to be some $150bn a year spread across the 68 countries that are parties to the initiative. Some are comparing Belt and Road to the post World War II Marshall Plan initiated by the United States to repair the broken economies of Europe. Between 1948 and 1952, the United States loaned vast sums of money to finance reconstruction of infrastructure, expansion of trade and the lifting of barriers to trade. The objectives of Belt and Road are similar but run the risk that massive investments in infrastructure will not on their own generate regional economic expansion. Ultimately, China’s dream is to see Eurasia develop into an economic and trading area to rival that of the United States and Europe. 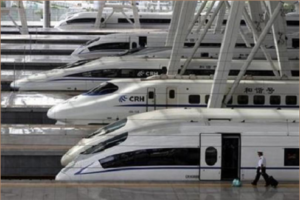 In terms of land connectivity, with more than twelve thousand miles of track laid, China has more High-Speed Rail than the rest of the world combined. Under One Belt One Road, construction is underway for High-Speed Rail to connect China with all of Southeast Asia and even beyond. 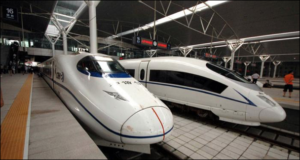 By the early 2020s, rail commuters will be able to travel by rail between Kunming, a major transportation hub in southwestern China, and Singapore in just 10 hours. 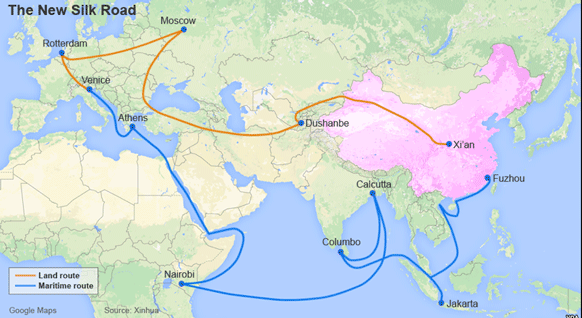 While most of the attention is focused on the Belt and Road Strategy for transportation infrastructure across the Eurasian landmass and the Indian Ocean, China has also incorporated the Arctic into its plans for a parallel Maritime Belt and Road initiative. A so called “Blue Economic Passage” would run along the Northern Sea Route. The original Maritime Silk Road, developed by the Qin and Han dynasties, was a trade and cultural exchange conduit between China’s south-eastern coastal areas and neighboring countries. There were two major routes, namely the East China Sea Silk Route and the South China Sea Silk Route. Export trade was dominated by silks, china, tea, brass and iron while spices, flowers, plants, and rare treasures were brought to China. This time round, along the length of a 21st Century Maritime Silk Road, China aims to develop closer strategic and trading ties supported by the coastal economic belt in China. In the longer term, the plan is to also develop a blue economic passage of China-Oceania-South Pacific, travelling southward from the South China Sea, deep into the Pacific Ocean. Establishing global power and influence through economic influence, and supported by military capability, has been a successful strategy since Roman times. It was also the foundation of the British Empire which by 1913 held sway over 412 million people, 23% of the world population and 24% of the Earth’s total land area. We may be seeing history repeat itself.